There was an essay in the LA Times magazine this weekend by Sharon Bordas, an aspiring sitcom writer talking about "staffing season," that hectic period after the series pick-ups in May when shows hire all their writers. But the essay wasn’t really about that. It was about sucking up. Her first interview didn’t go well, so she lavished praise on the next showrunner she met with. to give me the good news: Boy Wonder Two (BW2) loved me. She didn’t get hired as a writer, though. She got hired as a writer’s assistant. Not surprisingly, she lost the job on her first day when she pitched story ideas to the co-exec producer. She’s at a loss to understand why they got this impression of her and goes on and on blaming her career troubles on the inflated egos and duplicity of the showrunners she meets. The next day, one of the show’s producers announced that he had promised my job to the son of a friend. I was out. Again. It never occurs to her that maybe the third Boy Wonder called around about her and didn’t like what he heard — so came up with a lame excuse for backing out before compounding his mistake. The whole point of the essay is that TV shows are run by assholes and talented, good-hearted people like her don’t get a break. (She clearly thinks she’s coming off as lovable, funny, and sympathetic in her essay. She’s not). She looked down her nose at each showrunner before she even stepped in the door for her interviews. Each prospective employer was a "Boy Wonder," implying she thinks they got their show on the air not because of any talent or smarts, but because they kissed the right asses and sold out. They don’t deserve her respect, honesty, or good-will. They are frauds. She is the real deal. (Even the co-exec producer is shrugged off as "showrunner for the day" when he should have prostrated himself in front of her awesome talent). What was her interview strategy? To be a manipulative, lying little weasel, lavishing false praise on showrunners to hide her contempt for them. And when she finally snares an assistant position, she has the gall on her first day to suggest story ideas to the co-exec producer when, in fact, her job is to answer the phones, type scripts, and get everybody lunch. And she wonders why she was fired? Hollywood isn’t the problem, lady. It’s you. I had a pitch yesterday, and for some reason, it’s got me thinking of all the bad pitching experiences I’ve had (not that the pitch yesterday went badly, it didn’t, but that’s not to say he leaped out of his seat, kissed me on both cheeks, and said "My only goal in life now is to make this project happen!"). Okay, so here’s my story, which I’ve told here before. This goes back a few years. rock musician, accountant and personal trainer—interrupted me. “A dog,” he said proudly. “Does the dog talk?” I asked. I told this story a while back, when I first started this blog — but most of you weren’t around then, so it’s going to seem fresh and new. series, however, was not destined to be one of them. We went off and worked on the outline for our script. Television Producer read our scene, he was outraged. Gerald So, an editor at Thrilling Detective, reviews MR. MONK GOES TO THE FIREHOUSE on his blog today. He likes it. So do a few other bloggers. Writer Nathan Long has designed a logo for the International Association of Media Tie-in Writers (I AM a Tie-in Writer). Cool, huh? The logo will soon be up on the IAMTW site…where you can find lots of interesting articles about the craft and business behind novelizations and original tie-in novels. 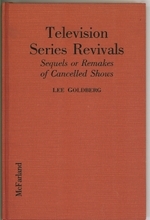 There’s a guy on Amazon selling my slim, 1993 reference book TELEVISION SERIES REVIVALS for $125.00, plus shipping. All I can figure is that it must be a typo…surely he meant $12.50, right? Then again, there’s someone else on Amazon selling the original library edition of my 1990 book UNSOLD TELEVISION PILOTS for $125. Why would anyone pay that much when they could get the same book for $45 or in a two volume, trade paperback edition for $26 each? get to a FIVE FOOT CORAL SNAKE?!?!?!? cannot even give you an opinion as to the writing of the rest of the book, as it has been converted into carbon in my fireplace. pointing out the errors in "The Deep Blue Alibi." found a bunch more and corrected them. warmth on a chilly night. Two television legends died on Friday — Don Knotts and Darren McGavin. Both will be greatly missed. I never met Knotts but I was lucky enough to meet McGavin — I interviewed him over twenty years ago, over a long lunch, for an article in STARLOG magazine. It was a real thrill for me, because I was a huge fan of his two series KOLCHAK: THE NIGHT STALKER and THE OUTSIDER, both short-lived classics. I remember him as a very gracious man and a wonderful storyteller. Over the years, I’ve also enjoyed his terrific readings of the Travis McGee novels… so much so, that I can’t read the books myself now without hearing his voice. We tried to hired McGavin for a guest-starring role on a DIAGNOSIS MURDER episode but he’d suffered a stroke and was unable to work. We ended up giving the part to Jack Klugman instead. I’ve written a few solid spec teleplays and one good feature, and moved to LA and tried to make contacts and all the other things you’re supposed to do. I am, however, a teacher and not a PA or writer’s assistant, so making the right contacts is a little difficult for me. My main interest is in television. A friend who works at a managment firm that rarely deals with TV writers recently told me I should start querying agents with my TV specs. How do I do that? I could write a feature query cold, for all the good it does anybody, but how do you write one for television? You can’t exactly use a logline to generate interest since you didn’t come up with the stories. Is my friend right? Would an agent even be interested in reading teleplays? Thanks for any advice you could give. specs available which sends the message she’s serious about this. reply she’s ahead of the game. clients – especially hungry junior agents. for an agent – didn’t work, but I did get some reads. knew the writer personally or the script was recommended. Believe it or not, hanging out with other aspiring writers is actually a good way to make contacts in the business. Many of my producer-friends today are people I hung out with at TV show tapings and Museum of Broadcasting events twenty years ago. I’ll give you another example, One of the writers we hired on MISSING, who had no previous produced credits or script sales (but a killer spec and a great personality) was part of a screenwriting group at a Barnes & Noble. When she got on staff of our show, all those people in the group suddenly had a "friend in the business," someone who could tell them, from first-hand experience, what the dynamics of a writers room were like, what kinds of specs the producers were reading, etc. If you’re interested in attending a UCLA Extension class, my friend Matt Witten, a writer/producer on HOUSE, is teaching an introductory TV writing class this spring and I’ll be teaching one this summer. "[My book] is unknown for the masterpiece that it is." "I’m not just another writer. I don’t think people understand my relationship with this city and they don’t understand what I’ve achieved." "There is not another writer in Southern California who sits between Bellow and Conrad next to Hemingway and Kafka…"
"Of course they admire me. They wouldn’t exist without me. I am in the canon. Those other people will never be in the canon." No, that’s not some fanficcer talking about himself and his immortal Harry Potter/Lord of the Rings cross-over slash epic … and it’s not Tono Rondone, James Kosub, Dr. Robin Reid, or even Lori Prokop, either. This ridiculously over-the-top self-love comes from writer Kate Braverman, basking in her own greatness in today’s Los Angeles Times. I’ve never read Kate Braverman. She may actually be the best thing to happen to literature since the invention of ink. She certainly has won her share of literary honors and has been a mentor to a very impressive list of admired, critically-acclaimed writers. But I have an immediate, instinctive dislike of anyone who calls their own work a "masterpiece" and touts themselves as legendary artists. Then again, the article mentions that Braverman has spent much of her life as a drug addict, which explains a lot. Most of the addicts I’ve known in my life also believed the universe revolved around them…and were furious when no one noticed. UPDATE 2-27-04: Writer Rodger Jacobs samples reactions from all over the blogosphere to Braverman’s comments…as well as stories about some of her even more outrageous behavior.